I survived last night’s fund raiser! Felt really bad for my friend who was holding the ‘event’, as only 4 people showed up! Needless to say, we had food coming out our ears; she had prepared a great menu of homemade minnestroni soup, cream of broccoli soup, French bread (to dip in the soup), homemade chicken salad to go on croissants, lots of snack stuff like chips and trail mix. Even made two huge trays of brownies (which we forgot about – I ended up bringing a whole sheet tray home!). It was still an enjoyable evening of joking with friends, washing dishes, doing a little knitting (got bored with that) and just hanging out with good people. The event was to raise monies for the leukemia/lymphoma society; her husband and daughter are going to participate in a very long walk in June for this (monies from this event were to help raise some of their support). She’s considering holding another fund raiser in the near future. Today it’s clear, 52 degrees and sunny – just the kind of day to catch up on clothes washing. Went to the library the other day and picked up three books so I think (in between filling the washer and/or dryer) I’m going to start a mystery book and crochet the border on another afghan. In a medium bowl, mix together mayonnaise with paprika and seasoned salt. Blend in dried cranberries,celery, bell pepper, onion, and nuts. Add chopped chicken, and mix well. Season with black pepper to taste. Chill 1 hour. Serve on toasted bread with mayonnaise, tomato and cheese, if desired, and potato chips on the side. Makes 12 sandwiches. Lightly butter each slice of bread; cut bread slices in half. Arrange bread slices in a 9 x 13-inch buttered baking dish. Brown sausage, using spatula to break up. Drain and pat with paper towels. Sprinkle sausage over bread slices. Sprinkle cheese over sausage. until well blened. Pour egg mixture over bread, sausage and cheese. Remove from refrigerator and let stand for 15 to 20 minutes. In slow cooker sprayed with non-stick cooking spray, place ham. In small bowl, combine honey, barbecue sauce and brown sugar. Mix well. Pour mixture over ham. Arrange pineapple over and around ham. Cover. Cook on low 4 to 5 hours for a fully cooked ham and 7 to 8 hours for an uncooked ham. until creamy; add 1/3 C. sugar, beating well. blended. Stir in 1 tsp. vanilla and pistachios. until golden. Cool on a wire rack. time, beating just until yellow disappears. cheesecake on a baking sheet. with sweetened whipped cream, if desired. Garnish, if desired. Serves 12.
run clear after breast poked in thickest part. In a 3-qt. saucepan, combine the first seven ingredients. vanilla and bananas. Stir in nuts and chocolate chips. Bake on ungreased cookie sheet, about 2 inches apart. Hope you're having a great, relaxing day! Were you a “stay up until the wee hours to watch the Royal wedding” (OR) did you sleep in (like me) and watch it all the next day? I don’t know exactly what it is about all the pomp and circumstance that fascinates me – obviously I’m not from royal blood and won’t be inheriting any estates or castles in the immediate future, but I find it interesting to observe the behaviors and requirements for living ‘royal’. I know quite a few of my friends were very much ‘into’ staying up to watch all the goings on (I’d rather sleep) and discussing all the key points (a) her gown – sleek and stylish or big & poofy (b) bouquet: small or large (c) her hair: up or down or a variation of that (d) ‘the balcony kiss’ (enough said about that one). My thoughts on that whole thing? I couldn’t imagine being in the crowd at the Abbey and having to STAND through three verses of both hymns AND throughout almost the entire ceremony! The absolute LENGTH of the entire walk from entry doors to the altar at Westminster – oh, my goodness! If her knees were shaking, it didn’t show – but that’s quite the endurance walk, for sure! (Most of us, having done the bride’s entry walk SURELY didn’t have to walk THAT FAR! I also found myself being a bit of a ‘crowd watcher’ – noticing the hats (mostly) of the attending ladies; from the demur, elegant ones to the totally ABSOLUTELY ridiculous, obnoxious ‘things’ worn by two of the royal first cousins of Prince William. One looked like a tan version of the Olympic Rings! (Can’t imagine having to sit BEHIND them – you couldn’t see a thing for the immenseness of that hat!) Well, enough of my grousing – it’s not my worry. Just glad that the entire ceremony went by flawlessly and that there were no dangers/interruptions, etc. to ruin their day. Sorry I haven’t written lately – no good excuse, really. It’s been my ‘normal’ week of knit group, special needs group and babysitting my grandson. Tonight I’ve volunteered to help a friend in the kitchen during a crafting fundraiser, so that ought to be fun. I’m taking my knitting for ‘afterwards’ when my shift is done. The event is going from 4 p.m. – 12 midnight (can’t imagine anyone wanting to be there for the entire time, but I’ve been told that some scrapbookers are very dedicated. This one is a ‘bring your own crafts, enjoy the food and large working spaces while supporting a good cause’ thing. Think I’ll give you some recipes in my next post; have to get ready to leave for the big crafting event. I will say that I’ve ‘put out the vote’ to my knitting group about whether they want to stay at the new church location or go back to Panera Bread. (Have received two requests before hand to consider going back – seems it’s been a matter of concern to several people in the group and they felt they needed to let me know before people just ‘up and left’!). So far, the vote is largely to return to Panera; that’s fine with me – just trying to keep the group together. over cheese. Cover and bake 45 minutes. Uncover, and bake 10 minutes longer. Preheat large sauté pan on medium 2–3 minutes. to a simmer. Serve sauce with mushrooms. layers except the cheese. Bake 30-40 minutes. Remove from oven and add last layer of cheese. an 8-inch square pan. Serves 8.
to serve. Serve with salsa. Serves 4. Place beans in a 2-quart casserole dish. reminds me of one of my former special needs students). 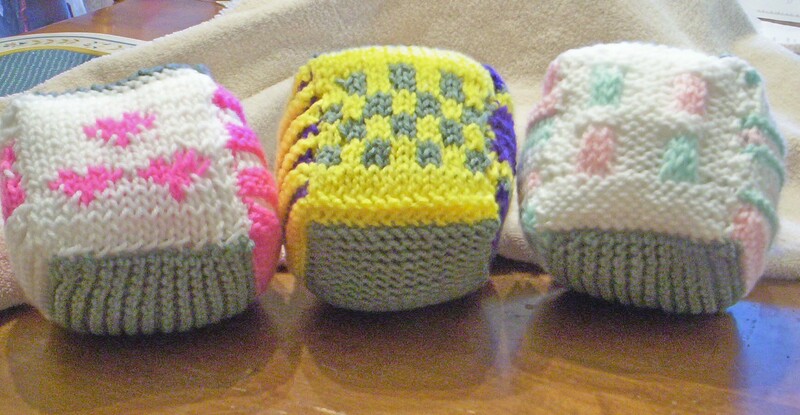 This morning I finished knit baby block #3, photo’d the baby gifts then wrapped them. Along with the knit ‘stuff’ is a really cute butterfly teething ring and the matching cup & divided baby plate. 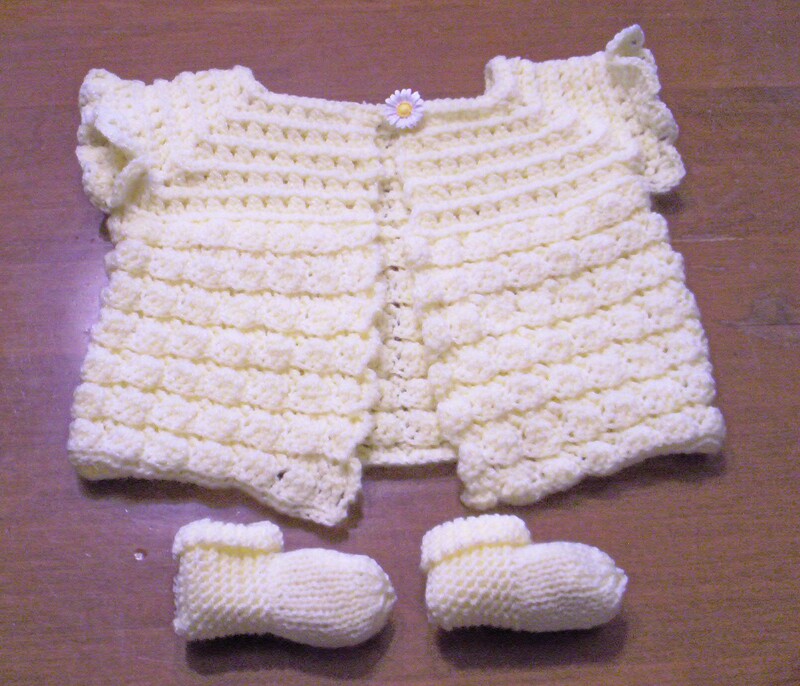 I think I just might have found a new ‘fun’ thing to knit for baby shower gifts – the blocks! I tried to make each block colorful; each has some texture also (by using purling it makes ridges – easier for a baby to be able to grip). They are all poly-fiberfill inside so they’re machine washable and very light weight. They were lots of fun to knit; gave me a stretch of my imagination trying to come up with different patterns that were both simple and would fit into just 15 stitches width. The one on the left is white, hot pink and (top & bottom) a sort of sage green; middle is bright yellow, royal purple and the sage green, right one is more baby colors: white, mint green and soft pink (with sage top & bottom). Easy to knit, fun to invent and doesn’t use much yarn! What’s not to love!? There you have it – today’s a bright, sunny day (50 degrees). Am currently awaiting my grandson’s arrival for an afternoon/evening of non-stop activity/busy-ness. Dinner is also going to be to his liking: Ravioli – easy to make and it goes a long way. Last night around 12:45 a.m. while I was sitting watching tv it sounded like we had a squirrel or large critter trying to climb the outside screen. Our youngest came running downstairs (from his room), middle son came running out of his room and both were yelling: “WHAT’S GOING ON?” It seems we were having a Hail storm, complete with lots of lightening (and thunder, which came a little later). Hail the size of quarters was pelting everything in sight, hence the ‘outside critter’ sound. This continued for 10-15 minutes after which came a torrent of rain which immediately melted the hail. What a rush! and found lots of ideas, then decided to make up my own designs. (By the way, if you’re interested – Ravelry is a free knit/crochet site but you have to sign up for it to get on. There are tons of free patterns, ideas and lots and lots of crafters who love posting their projects. You can ask questions about particular techniques/yarns/patterns, etc. – it’s a GREAT site! (I knew that this week would be different for me, as I don’t have any of my ‘usual’ things to keep me busy like special needs group, knit group, etc. – See? It only took me a few days to come up with another new project!). Will post photos when I’m done, along with the completed afghan, baby sweater I finished off, and the 3 pairs of baby booties (think that’s all). syrup, and vinegar. Pour over peaches and pork chops. Cover 7 cook on Low 3-4 hours. egg, water and oil until well blended. tablespoonfuls into sugar; roll to coat. drain.Stir in soup, milk and tuna; top with cheese. Mix bread crumbs with butter & sprinkle on top. center of dough. Sprinkle  with more dill to cover. to completely enclose. Bake approximately 15 minutes. of rain. Right now it's 43 degrees, clear and sunny! Grocery Shopping and Potato Recipes! After my not wanting to shop yesterday, I certainly made up for it today! Started out at KMart for a new pair of bedroom slippers for me (my old ones are finally worn out) – ended up with 12 pairs of socks (each) for both boys (who needed them – they keep losing them! ), some Easter candy goodies and that’s it. Decided to give Meijers a try for slippers (they have a great store, I just don’t like going there – too crowded at ANY hour/day plus I get too tempted to go way over my budget when I see some of their things on sale). Got a pair of slippers AND got tempted and bought a nice salmon-colored top for Easter! No, it wasn’t on sale, but it was calling to me – you know . . . CALLING to me!!! After that went to WalGreen’s which had lots of great stuff on sale – Green Giant canned veggies, canned salmon, cereal, dish soap, more Easter candy goodies, aspirin (buy 1, get one free – at 79 cents a bottle for 100! -that’s a GOOD deal!) – they even have 12 greeting cards for $1.50 a box – got ‘sympathy’ and ‘friendship’ boxes (can’t beat that price, either!). Next it was off to Kroger’s where I sort of went a little wild – I’ve been trying to stock up on canned/boxed items (just in case the ‘some people are predicting a major economic failure soon’ turn out to be right). Kroger had Kraft boxed mac & cheese for 89 cents a box, Rice-a-Roni & Noodle-Roni $1.00 a box, canned baked beans $1.29 for a big can, and several other items. By the time I left there I’d SAVED $49.04 ! My husband figured out that I’d saved 25 % just at that store, so he was happy. Got a nice, spiral-sliced ham with glaze packet on sale, splurged a little on Dearborn hot dogs (they were on sale, too) – my husband & I love them because they’re natural casing – (our kids don’t care for them, but I still hide them . . . hehehe), and a small container of garlic hummus for me (a rarely bought, but dearly loved item). They had green seedless grapes on sale and large pkgs. of fresh strawberries 2/$4 (got 1). I feel like I bought a king’s ransom in food AND saved a bundle, so I’m happy. On the way home I stopped at our local dollar store and bought 2 large ‘baby shower’ gift bags 2/$2 – I told the owner he’s STILL the best deal in town for gift bags! (Oh, found a really cute plastic baby divided dish & matching cup for the shower – $1 each at WalGreen’s!). Ok – now on to Potato Recipes! Part of our Easter Sunday breakfast is Onion potatoes; I’ve never made them but read the recipe and thought I might like to do these at home for us. (It appears I’m in a cooked potato mood lately, so here are two yummy sounding recipes for potatoes). Mix together above items and place in a 9 x 13 pan. Stirring occasionally, bake 35 minutes or until potatoes are tender. Makes 4 servings. In large saute pan, heat oil over medium-high heat. Add potato cubes and season with salt & pepper to taste. Saute, stirring frequently, for 5 minutes. Turn heat up to High, add water, stir and cover pan with a lid. Steam potatoes until the water evaporates, about 3-4 minutes. (Check every 1-2 minutes to stir potatoes so they don’t stick). Lower heat to medium and saute another 1-2 minutes until all traces of water are gone. Toss in the butter and stir to coat potatoes. Spread potatoes out on a baking sheet. Bake in oven until potatoes are crisp and browned to your liking, about 15-25 minutes, depending on how dark you want them. Transfer potatoes to a serving bowl and serve. Makes 4 servings. I still have one more shopping trip to the drug store but am considering going tomorrow instead – right now I’m in the mood for sitting down and enjoying my Tim Horton’s coffee (picked one up for husband & me – it’s our little ‘treat’) and trying out the new slippers! Enjoy your day – we didn’t have any snow OR rain today, it’s just grey, chilly (41 degrees) and cloudy, but I don’t mind – I can always put on a jacket and walk/drive in ‘cloudy’ – it’s different if it’s snow or rain! This day began by awakening to the announcement (from husband) “It SNOWED!” Now he wasn’t talking a little bit (which I expected) – we probably got about 2 inches! Ground, car, streets etc. all covered with the white stuff – ugh. Bothered me enough that I went right back to sleep! I don’t know what it is about my mind thinking “Spring” (and knowing in the back of my mind that we probably ‘could’ get more snow) and then facing it when I wake up – just down right depressing! That said, it’s been a very slow-developing day. Got up and sort of ‘hung around’, not doing much at all – no energy. I had originally planned to go grocery shopping but that didn’t happen. Finally roused myself around 12:30 p.m. and got dressed, did the dishes in the sink, emptied the dishwasher and straightened up the kitchen then baked a 9 x 13 batch of brownies (just for encouragement – you know how that goes, one needs the ‘encouragement’ of chocolate when one’s ‘down’!) There was a big pile of coupons in the Sunday papers so proceeded to cut them all out (a friend from church works with a group that sends all the coupons to a center that sends them to various military bases for the families there – I guess the coupons there can be used up to 3 months AFTER the expiration date on the coupons – pretty neat!). During mid-afternoon the snow finally melted – roads clear, car clear – did I go shopping? Nope – but got the grocery lists organized for tomorrow, went on line to check grocery store fliers and compare prices so I’ll be ready tomorrow. Are YOU ready for Easter yet? For Easter dinner? In years past I used to look forward to cooking but ever since we began volunteering with the church Easter breakfast, I’m just totally exhausted once we get home and don’t feel like cooking anything! Am planning a pared-down menu this time – ham, some sort of potatoes, green bean casserole, snowflake rolls – that’s about it; don’t even know if oldest son & his family will be joining us. I did notice one thing when looking through grocery store fliers – I didn’t see too many advertisements for varying prices of hams, as in years past. Strange. Prices – have you been following the price of GAS lately? WHEW! About a month ago I remember paying $3.49 for regular, now it’s almost at $4!!! I saw several signs at gas stations by our church (which is just off an expressway, hence higher prices) for $4.15! That’s crazy! But what can we do, except walk, ride a bicycle, or just not drive? (I say this knowing that this coming Saturday/Sunday I’ll be putting a LOT of miles on my car – sigh). Just finished dinner – Potato & onion pierogies with sour cream, broiled Polish sausages – filling but here at my house it’s almost known as “Comfort Food”. Prepare rice according to pkg. directions. In large skillet over medium heat, melt 1 tsp. butter. Season chicken breasts with salt-free seasoning. Saute chicken 4 minutes on each side, or until cooked through. Remove chicken from skillet and keep warm. Add cider and Dijon mustard to skillet and simmer 3 minutes. Return chicken to pan and coat with sauce; remove from heat. In medium saucepan, melt remaining butter. Add pecans and stir until lightly toasted. Add cooked rice and salt; toss to combine. Serve rice topped with chicken and sauce. Garnish with parsley. Serves 4. Lightly butter a 9 inch square aking dish or a 2-Quart casserole dish. Combine rice, onion, red pepper, peas and cheese sauce. Spoon mixture into baking dish. Evenly place sausage pieces into the mixture and top with shredded cheese. Bake 20-30 minutes or until bubbly and browned on top. Serves 8. Coat 9 X 13 baking dish with nonstick cooking spray. In a large skillet over medium heat, cook bacon for 4-6 minutes, stirring occasionally. Heat oil in another large skillet over medium heat. Cook hash browns for 2 minutes, turn over and cook for another 2 minutes. Add vegetables, cook 3-4 minutes. Transfer evenly into baking dish. In medium bowl whick together eggs, milk and salt. Stir in cheese and cooked bacon. Pour evenly over potato mixture. Bake, uncovered, 40-45 minutes, or until eggs are set.Serves 9. Note: casserole can be prepared ahead of time up. Cover and refrigerate uncooked casserole until ready to bake. Our weather report predicts rain for the next few days (but no more snow) – sure hope that holds true. Like I’ve said before – I well remember the Easter when I was about 8 when we had a really big snowfall – no fun! Enjoy your week – remember to smile a little, laugh a little and relax when you can! PS: Kroger’s is featuring 1 dozen eggs for 77 cents this week – that’s a great bargain! It’s Friday – I Made It! It’s a gorgeous Spring-like day – sunny, slight breeze (unfortunately only 48 degrees F.) but still really NICE day! The sunshine sort of sparked a (slight) cleaning spree for me – got some dusting & wet-mopping done (now I’m glad that’s over!). It’s a ‘let’s get some ‘stuff” done around here that I wouldn’t normally do – mailed off 3 get-well cards, caught up some special needs group paperwork, that sort of thing. In my perusing the emails, found some really yummy-sounding recipes which I’ll share shortly. It’s Friday and I’m just glad that today I don’t have anything (that I know of, anyway) scheduled to go to/get done/rush – drive to , etc. The crazy schedule of earlier this week is finally over – YAY! Went to youngest son’s Parents Show and it was really good – the drum line was excellent (first time hearing their competition routine – WOW!) – they had about 7 marimba’s playing, a ton of marching drums and several bass drums – the kids were amazing! (esp. the one head girl marimba player – professional quality, for sure!). The color guard did their routine and I was a bit surprised, as their coaches had switched up a bit of the routine at the end, but it was very effective. Our son and another young lady were the key players (sort of a ‘lost love, ‘come back to me’, ‘no way – go away’, no – wait – come back! sort of thing, if you can follow that. At the end she dumps him and he yells “NO!” very loudly and that’s the end of the routine. In between is lots of various flags/sabers/rifle work by all involved, all done to music. I know it sounds jumbled, but it worked very well. Their group actually went from class A, to a completely different division AAA ranking, so that’s a big jump in their development. Youngest is, of course, planning on being in Color Guard again next year. Knit Group (same night as performance) went well – my ‘helper’ held down the fort while I was gone; we did the special collection for our friend who’s husband recently died and I was very proud of all of them for their generosity – it was a large money amount and she was totally caught off guard (I gave her the envelope just before she left and she counted it at home then emailed me. Well done, ladies! Wednesday Special Needs group found me in charge (last minute) but it was Birthday/Music night and it went well (Whew – sigh!). We had 32 students and about 8 caregivers, so the room was packed and (my job) cutting cake got a little frantic, but it all worked out in the end! Yesterday (Thursday) found me back to my old routine of babysitting my grandson: 4 p.m. – until his Dad picked him up (anywhere from 7:30 p.m. on, last night it was 8:15). We watched the movie: “Up!” (he’d seen it before, but it bought me a good 1 1/2 hours!!!). It’s a cute movie, (CGI – Computer Generated Imaging) has a good plot line, with a bit of excitement – good for adults as well as children – I’d recommend it! Place chicken breasts in baking dish. Mix remaining ingredients together, and spoon over chicken breasts. Bake uncovered 40 minutes. In a 1-1/2-qt. slow cooker, combine first five ingredients. stir until blended. Serve warm with bread or crackers. blend about 15 seconds or until blended. temperature. Cover and chill at least 4 hours. mixer on high speed, whip cream until noticeably thickened. Grease 12-cup fluted tube cake pan with 1 T.
butter. Cut all 13 biscuits into quarters; set aside. 1/2 C. butter, hot fudge topping and vanilla. into hot chocolate mixture, gently folding in to coat. down over pan; carefully turn plate and pan over. in pan onto bread. Pull apart warm bread to serve. corn flakes. Bake 1 to 1 1/2 hours. Makes 8 to 12 servings. In a large skillet brown ground beef with onion and garlic. Drain well. Stir in taco seasoning, salt and pepper. Place three tortillas in bottom of the crockpot. of cooking time. Serve with sour cream. It's been a wild week but I'm finally 'coming around' - Oh! afghans. Current total count on afghans done for that: 283.
together as fast as people want to make MORE squares! I'm 'in it' for the long haul. I really don't mind. Hope your week and coming weekend are just great! Yep, it’s “Life in the Fast Lane” again this week; several scheduling changes (and re-changes) going on. Earlier in the week I was to fix dinner for a friend who’s husband has been in the hospital ICU for several weeks; not a problem – made a large chicken salad (her request) with homemade garlic bread the evening before only to get the email that her husband died that night. The next day (Tuesday) I wasn’t sure just what to do – call there, go over or what – tried calling and it went immediately to their machine so I just went. Turns out it was ‘perfect timing’ – they were just getting ready to go to the funeral home to make arrangements and had totally forgotten about me bringing dinner – that worked out just great (Thank you, Lord!). The funeral was this morning and I’ve never been to a shorter service – sad. The wife is a good friend in my knit group and I’m really hoping our members will be extra generous this coming week – I’ve emailed them asking for a cash donation as this family is (and has been) in a very serious financial situation. Yesterday found us babysitting our grandson all day – that was a bit of a surprise (they came 1/2 hour early) – I thought he had school, turns out they were out of school for TWO weeks Spring break, so that left me with trying to figure out how to keep him amused for an entire day (10:15 a.m. to 8:30 p.m.). I took him with me to the grocery store and to make a quick trip to pay a bill (that killed about an hour). We rented the movie: “Tangled” (the ‘new’ version of Rapunzle) and we watched it – it was cute/typical Disney. He played with blocks, cars & trucks and puzzles – we got through the day. I was happily surprised when he ate a huge slice of my homemade pizza (he’s lately been getting picky about eating). This coming Tuesday’s schedule has been a bit of a ‘bone of contention’ for me – our youngest’s Color Guard Parent’s Show was supposed to be this past Tuesday evening – that would have been just great! We didn’t have anything else on the calendar for THAT night! Change of plans – now it’s scheduled for THIS COMING Tuesday night (my Knit Night!). First it was supposed to be 6:30 p.m. and I made other arrangements with another member for her to be there extra early so that I could unlock the church, set up the coffee stuff & goodies, turn on the lights & up the heat then go to the show while she ‘held down the fort’ until more members came (don’t want to leave the church unlocked and empty while I’m gone). Then they changed it to 6 p.m. – and shortly thereafter it got changed to 7 p.m.! Will they just cut it out and decide??? I still have to contact the ‘helpful’ member and tell her what time I NOW need her there – crazy! At least youngest son can get a ride to the school – they want HIM there at 6 p.m. (our knit group starts at 6:30). I guess, if I really think about it, 7 p.m. will work out for me – I can get to the church early and ‘do my thing’ then swing back home to get my husband so we can see the show (it’s only supposed to be about 1/2 hour, total including the Drum Line show!) then I can drop husband back at home and go wrap up the knit group. The only ‘down’ thing for me is this is the night I planned on doing the money donation for our friend who just lost her husband, so will have to have enough time to get that worked out – SIGH . . . big time. (my husband’s comment was: “Just cancel knit night – you KNOW you can!” . . . NO, I DON’T know I can . . . too many other people involved to just cancel at MY whim!) I know it will all work out – just a bit stressful (as usual for me). Upcoming in the next few weeks is the Easter preparations for our church Easter breakfast and church service. For the past 3 years my husband and I have helped with the breakfast, me getting to church early Saturday for ‘food prep’ and then helping serving the food that morning before the service – not a problem. This year I signed up for the food prep early Saturday totally forgetting that I have a baby shower (the one I’ve been working on the baby blanket for) that same day at 3:30 . . . not remembering that there’s also the LAST choir practice that night before the Easter program the next morning! ROLLER SKATES! I’ll be needing roller skates to get it all done on time! Am thinking of asking just what time is the food prep Sat. morning before deciding if I’m going to be doing that as well as the shower & choir practice. It wouldn’t be so bad EXCEPT that our church is 25 minutes from our house, the baby shower is about equal that distance from the church and then repeat that with me going back to church for the choir practice . . . WOOF! Lots of running and lots of GAS! We’ll see just how this all plays out. 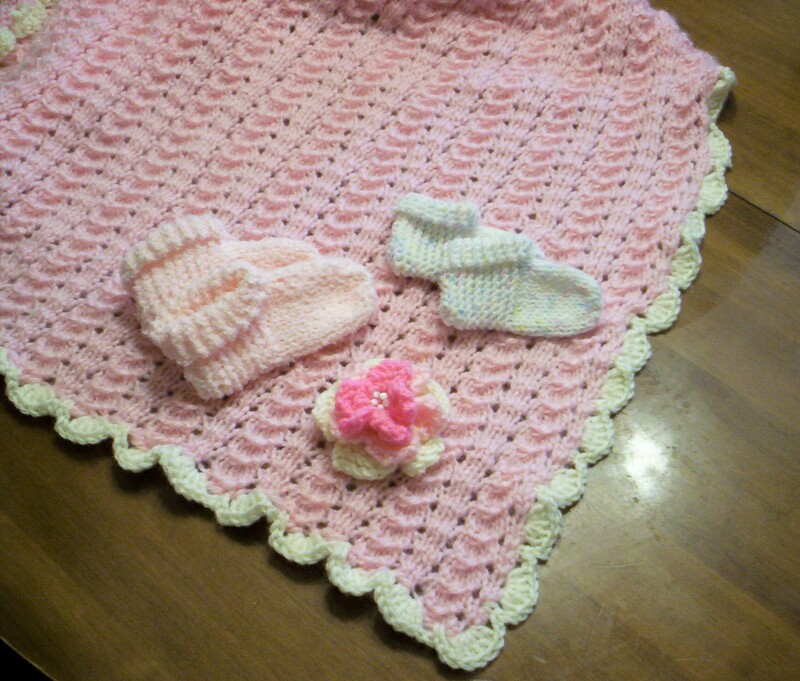 Am down to just finishing the crocheted border on the afghan; have 3 pairs of baby booties done to go with it. A while back a friend gave me a bag with some donated yarns and semi-finished knitted items in it. In the bag was a really cute yellow baby sweater, minus it’s sleeves. I’m not a good pattern follower but when I looked over the sweater, it’s enough finished for me to be able to just crochet cap sleeves on it, crochet a chain fastener to use as a button closure and then buy a cute button to go on it and VOILA! It’s a done deal! 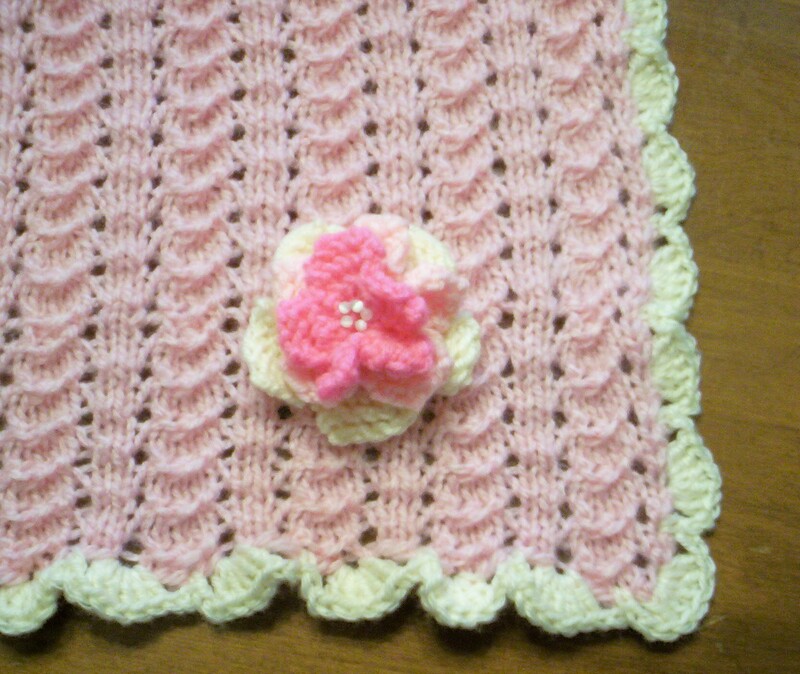 It will go well with the other knit items for the shower! (the baby will be living in Florida so it doesn’t really need a heavy long-sleeved sweater – this one will work just fine!). Well, that’s what’s going on around here lately. Busy, busy, busy! It’s kind of nice knowing that (other than the funeral) I don’t really have anything planned for today. Started reading Kitty Kelly’s book “The Royals” – haven’t gotten very far into it yet; I remember the big ‘stir’ it caused when it first came out years ago – will see if it’s good enough to finish or just return to the library. Today is a gloomy, grey and semi-rainy day (43 degrees F.) so might just be the perfect setting for getting cozy in my recliner with an blanket, my vanilla-scented candle burning and a book to read – we’ll see! At her site you can see a more detailed selection of photos of the afghan plus a very neat photo of her husband resting on his afghan. On his stomach is the LVAD machine (Left Ventricular Assisting Device) the machine that’s keeping his heart working until such time as he can be put on a heart transplant list. It’s always great to know that something you did/created/took a small part in helped someone else get through a very tough time in their life.